Not many can claim to be living in a 600 years old heritage home, but that was the case with the Bara Lao Ka Gumbad. Before Archaeological Survey of India undertook the monumental site under its care, a family had been living inside the monument for more than 3 generations. Located in the DDA Park in Vasant Vihar, the Lodi Era monument was abandoned by the authorities for a very long period of time, leading to illegal encroachments. 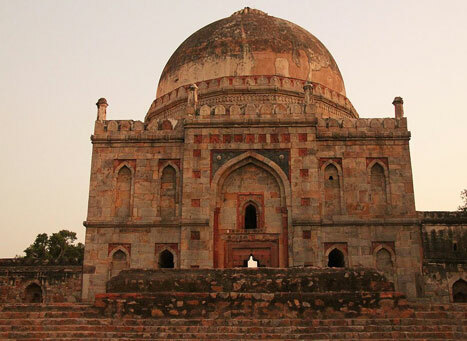 One of the forgotten monuments in Delhi, Bara Lao Ka Gumbad once exhibited the royal architecture of Lodi dynasty. But after the encroachers started living there, the monument was converted into makeshift living place. The walls were painted and damaged which led to authorities regaining the ownership of the place. Since then, the walls have been renovated, the main tomb’s damages have been repaired and most of the monuments have been restricted to the general public in order to preserve the heritage site and ward of the encroachers. Not much is known of the history of the Bara Lao Ka Gumbad except for the era in which it was built. The architectural style hints the monument to be from the Lodi era. The monument is believed to be of the time before Mughals ever entered India. But as the time passed, the monument was left unattended. Post-independence, many encroachers made the monument there home. They set up electricity and running water facilities inside the monument. Prior to Commonwealth Games in Delhi in 2010, The Archaeological Survey of India and DDA joined together to remove the illegal encroachment and preserve the monument. The move also gained support from the local resident welfare association, who were in favour of restoring the monument to its former glory. The people residing inside the monument fought the battle of legal ownership, citing that the lands belong to Wakf board and they inherited it from their ancestors. The ownership was granted to DDA who under the assistance of Archaeological Survey of India restored the monument. In 2018, the monument was up for adoption under the “Adopt a Heritage”, started by the Government of India. The monument was adopted by a private body; the move would ensure that the monument is preserved for a longer period of time. The nearest metro station is Vasant Vihar on Magenta Line of Delhi Metro. From the metro station, you can either take an auto or walk to the monument. Vasant Vihar is a plush residential area in South Delhi. You can visit the markets of Vasant Vihar and malls in the Vasant Vihar market. There are also numerous cafe and restaurants in the neighbourhood which offer lip-smacking food. The monument is not open for public visit. Situated in the DDA Park, people can watch the exterior walls, rest is prohibited for public entry. The timings for the DDA Park is 6 am to 11 pm. The monument inside the park can be visited throughout the year, but the winters are the best time to visit. Sightseeing tour in Delhi can be excruciating during summers, hence the colder temperature of winters is ideal for exploring Delhi.